When Ms. Uyanga Erdenebold, a blind student from Mongolia, arrived at Louisiana State University on a Fulbright Program scholarship, she had to get used to a new city, a new country, and the rigors of graduate school – not to mention the humidity. As she pursued her Master’s degree in Library Science, she learned to travel independently with a white cane, honed her computer skills, and read extensively for her studies. Ms. Erdenebold reported being forever changed by her experience in the United States, which she describes as "an interesting, dynamic and encouraging one." For international professionals and students who are blind or have low vision, visiting the United States just became easier. The National Clearinghouse on Disability and Exchange (NCDE) has published a new informational tipsheet to assist international blind and low vision visitors in preparing to come to the United States. This tipsheet contains a variety of resources about access and independent living. Read: "Blind Visitors to the United States: What you need to know" at:http://www.miusa.org/ncde/tipsheets/blindvisitorstousa. Guidance for locating resources—orientation and mobility services, dog guide training, public transportation access, live reader services, etc. Tips on independent living—cooking, laundry, managing money, etc. Primary emphasis of this new informational guide is on enhancing the U.S. experience of blind visitors who are coming for academic or professional training, but the resources may also be useful to U.S. residents and international people traveling to the United States for other reasons. Mobility International USA is a cross-disability organization serving those with cognitive, hearing, learning, mental health-related, physical, systemic, vision and other disabilities. Their mission is "Empowering people with disabilities around the world to achieve their human rights through interational exchange and international development." Ever find yourself asking, "Who designed this thing anyway?" I do. I also found someone who figured out what to do next. Her story might someday impact us all. Julie Jones is founder and CEO of Engineered Travel. Engineered Travel, LLC (www.engineeredtravel.com ) works with manufacturers of existing products and shows them how to apply Universal Design thinking. The result can be anything from product improvements involving simple engineering changes to the development of entirely new products to meet the needs of the disability market. The company is busy at both. Julie has teamed up with Bob Davis of the GEOS Travel Safety Group http://www.geosalliance.com GEOS provides integrated security, safety and resilient communications services for corporations as well as domestic and international travelers. 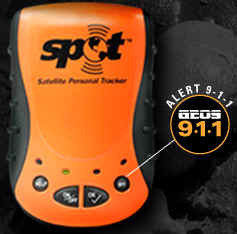 With former police, military, and government security professionals in-house and having extensive knowledge of search and rescue (SAR) practice GEOS partnered with the manufacturers of the SPOT Satellite Messenger to provide a new type of personal safety device. I have been field testing it. I like it! Let me reiterate that the purpose of Engineered Travel LLC is to take products that were not designed with our community in mind and make them accessible. That said, even with opportunities for design improvements I have had fun playing with SPOT as I traveled from Brazil to Alaska. It evoked a satisfying round of "tech envy" as I took it out of my briefcase during a meeting of technology innovators in San Francisco recently. I am getting quite a few requests to be added to the list that receives a SPOT "Check In" email pinpointing me on a Google map as I globe trot with SPOT. There is always inconvenience, even risk involved in travel. For someone with a disability what may be inconvenience for some can be a risk - a vehicle that goes dead somewhere out of cell phone range for example. This is where a personal location device like SPOT literally becomes a life saver. The orange and black ruggedized waterproof unit has several functions. These include 9-1-1 mode, a less urgent Help mode, and a simple Check-in mode. New York City, July 1, 2008. Today tripwolf.com (http://www.tripwolf.com) is released publicly to the US market. tripwolf is a new social travel guide that covers the whole world, focusing mainly on Europe. tripwolf combines professional editorial content with user-generated content from globetrotters worldwide. tripwolf is backed by MairDumont, Europe's largest publisher of travel guides including Baedeker, Dumont and Marco Polo. Through collaboration with tripwolf, MairDumont has taken the unprecedented step of putting all of its content - covering more than 200,000 destinations and points of interest - online for free. Scheduled for today on A Different Perspective is Howard Renensland's interview with Scott Rains (as seen in the photo). Scott, of the Rolling Rains Report, is a very busy man these days and if you're at all interested in travel, you'll want to listen in. Wild Iris Medical Education offers a useful course entitled, Traveling with Disabilities authored by Anne M. Becker, MS, RN, CNS and Miriam R. Breslauer, BS, MS. The course is free through June 30, 2008. Tell Me, What Will Our Grandchildren See? “It looks like flying,” piped a voice from the deck of the Sea Wolf somewhere behind me. It was like flying as I looked out at the glacier-studded mountains ahead and the glass-smooth Alaskan water of Glacier Bay around the kayak floating below me. It was a kind of freedom I never expected as I signed on to spend a week cruising on a wheelchair-adapted yacht with Waypoint Yacht Charter Services. Each morning I made the leap overboard. Strapped into a device that held me securely I was lowered – “flying” – into a tandem sea kayak. Some days, like the first one at Reed Glacier, immersed me in a passionately delivered course on biology, botany, geology, glaciology, and the history of the Tlingit people. I bobbed in front of a glacier towering 10 stories above me as the articulate young naturalist, Sarah Betcher, paddled us expertly. Intimate and ego-erasing was the combined effect. Comfortable and safe far beyond what I imagined could be possible for me as an aging ever-more-obviously-quadriplegic. Other days, like when we anchored in Tidal Inlet, I earned my fifteen minutes of outdoorsman’s fame by spotting a pack of wolves – black, tawny, silver – five in all. With seven passengers and four crew members the Sea Wolf was the perfect size for experiencing small-ship cruising. Built to hold 12 passengers in 3 wheelchair-adapted and 3 non-adapted cabins there was room to spare onboard and I enjoyed my solitary accommodations to the hilt. Simply opening the cabin door put me 32 inches from the sea on this retrofitted World War II minesweeper with decks widened and lifts installed for wheelchair users. To experience Alaska is to experience the earth revealing a majestic that only truly impacts you when you encounter it at the human scale of a small boat, kayak, or you own body. Once, at Marjorie and Grand Pacific Glaciers, our flea-sized flotilla of kayaks glided past nesting puffins, cormorants, Bald Eagles, and endangered species of gull. We weaved through the ice floe shortly after sunrise to listen to what the Tlingit called “white thunder.” Those explosive cracks of gas release and the body-resonating reverberation of calving glaciers are a wake-up call. The same call was evident on the faces of the small knot of passengers standing at least 15 stories above us on the promenade of a mega cruise ship that obliterated our view of the 5,000 year old river of ice succumbing to gravity and dragging mountaintops to the sea. Those passengers, turned away from the glacier, chose to vicariously enjoy our vulnerable rapture by spending the half hour that their floating city-substitute left its carbon footprint over the fastest-receding glaciers in the world. My morning meditation was for them – handicapped by a mode of transportation that has made neither the transition to socially-inclusive Universal Design to sustain them on a human scale or to Green Design in order to preserve the sacredness of place for seven generations and beyond. I can think of only two words for the Tlingit grandparents who preserved this place intact; to the park rangers, residents, and responsible tour operators who continue to do so; to my shipmates on the Sea Wolf who gave generously to allow me to experience it – and for the cruise ship-bound congregation whose longing for wilderness intimacy freed them to engage in our morning meditation. From May 25 through May 30, 2008 I tested out the accessible small-ship cruise of Glacier Bay, Alaska. This device -- the McKinnon Hugger -- was a key "freedom machine" that allowed me to move from the boat to a sea kayak each day. Another helpful piece of outdoor adventure gear for transfers to bush planes and kayaks was the Comfort carrier by Gimp Gear. Waypoint Yacht Charter Services books the wheelchair-adapted wood-hulled yacht the Sea Wolf. The Sea Wolf is a World War II minesweeper just like Jacques Cousteau's original ship the Calypso. The yacht is small enough to be intimate (six cabins/ three wheelchair usable.) It is retrofitted with wheelchair lifts to each of the three main decks. 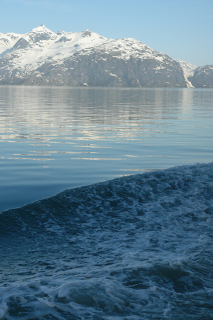 As Sea Wolf cruises Glacier Bay, Alaska passengers with disabilities can enjoy the sea kayaking or skiff excursion options because the owner has installed a unique lift system. I was out of my wheelchair and into my kayak with the splash skirt fitted down in 3 minutes thanks to a skilled and attentive crew. I travel around the world researching inclusion in tourism (just back from Brazil and on to India next month). There is a growing base of practitioners, venues, and travelers with disabilities developing a sustainable adventure tourism market. This project in Alaska is one of the pioneering efforts in this emerging field. Let's assume that you found this article because you plan to travel. Let's also assume that you, or someone you are traveling with, has a disability. What can you find at Suite 101 that will make your trip easier? Suite 101 is an amazing place. Nearly 600 of us volunteer our expertise as writers, researchers, and editors. My fiefdom, Travel & Disability, was developed specifically to provide resources on inclusive travel for seniors and people with disabilities. Other sections cover additional topics that might be just what you are looking for: travel planning, destination reviews, family travel, in-depth information on a specific disability and more. Congratulations, Scott Rains of the Rolling Rains Report! The proposal to open three Centers of Excellence in Inclusive Tourism that is being considered by Echoing Green Foundation and publicy discussed at Ashoka's Changemakers' Geotourism Challenge has generated 80 comments from around the world. [San Jose, CA, USA] – The National Geographic Society and Ashoka’s Changemakers have introduced the first Geotourism Challenge to identify and showcase innovators in tourism development, management, and marketing. The one-of-a-kind online collaborative competition is designed to raise awareness about how tourism can help sustain, enhance and preserve local culture and environment. The Rolling Rains Report is a featured entrant. The Rolling Rains Report is an experiment in achieving social inclusion. As a daily online publication it provides research and educational material emphasizing the quality of tourist experience of a group who has historically been denied access to tourism - people with disabilities. At the Geotourism Challenge an expanded project is proposed. The Centers of Excellence in Inclusive Tourism Project will bring to scale sustainable inclusive tourism development projects piloted in Asia and the Americas. The project goal is to make the tourism industry an authentic partner in the aspirations, rights, and culture of the disability community by establishing local collaboratives, directed by people with disabilities, to provide tourism product creation, infrastructure design, and destination development services to the tourism and hospitality industry. Analysis of the study results is available at Travolution.